Something kind of major happened to me this past week. I finally learned to knit! I already “knew” how, technically, but I hated it. It just didn’t work for me. Crochet has always felt good in my hands but I just never could get comfortable with knitting needles. Every few months for a couple years I’d pick up a project and try again, but I’ve never made more than a dish towel and I’ve never enjoyed it even for a second. I’d get tensed up instead of calmed. Then I discovered knooking! At the risk of sounding totally dorky, knooking is like a dream come true for me. I’ve actually day-dreamed that knitting could feel like crochet for me, and that I could make knitted patterns without dealing with knitting needles, and–ta da!–it has happened! Knooking is making knitted fabric (interlacing yarn in the way known as “knitting”) but by using a crochet needle attached to a cord. It turns out the exact same product but feels like crocheting instead of knitting. Which, if you’re me, is totally fantastic. I used this blog, this blog, and this Ravelry group as references and used a locker hook as my first knooking hook. 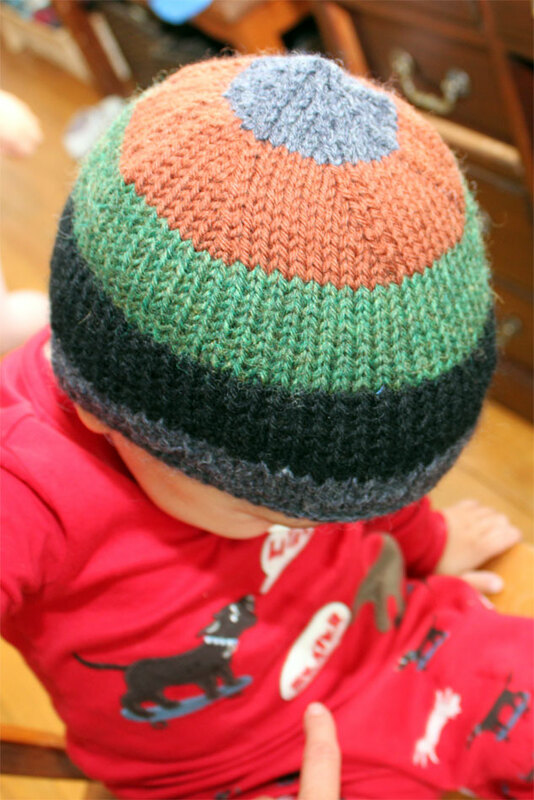 I knooked this hat for Worth by reading the tips at those links and holding the new hat up to a hat he already had for sizing. I’m ridiculously pleased with it and don’t you make fun of me, dangit, because it’s not every day that dreams come true. Today I put down my next knooking project long enough to have a great day at an outlet mall with an old friend. She lives in Indianapolis so we met in between her city and mine for a fun day of catching up and fall shopping. 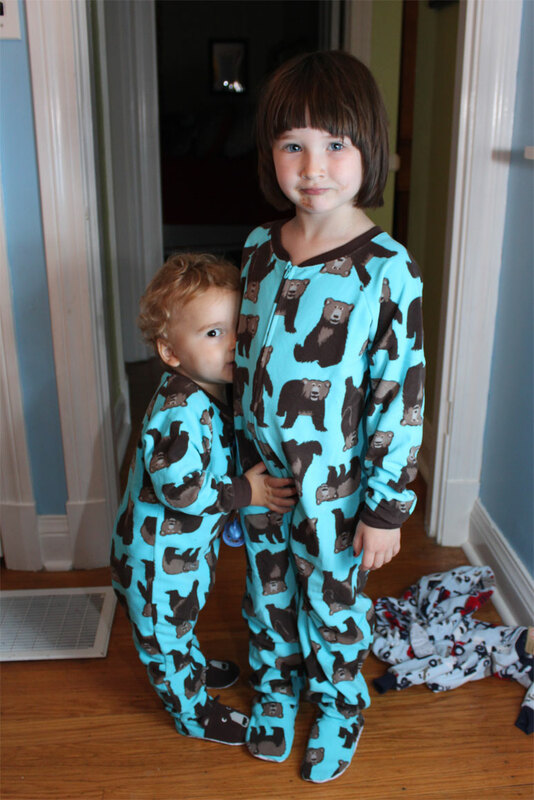 I purchased what I thought were matching pajamas for my kids, who spent the day with their grandparents. Back at home, Worth wanted to put on his new pajamas right away. 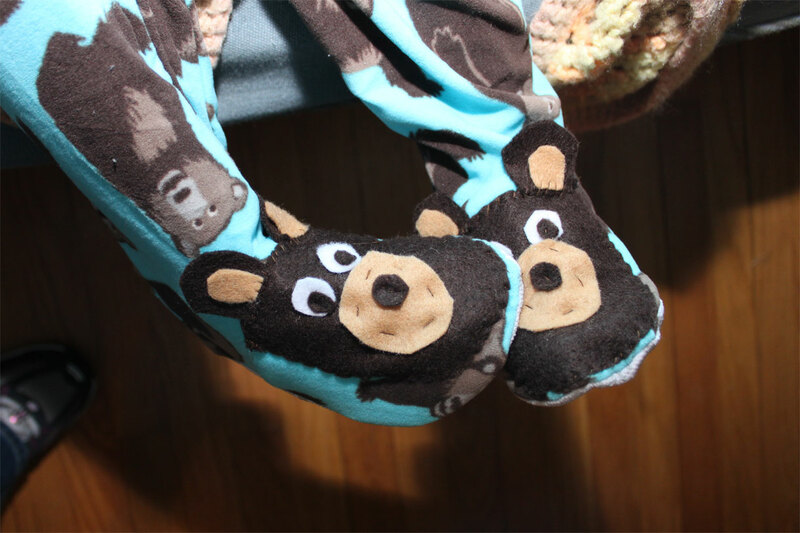 We allowed him to change and he immediately started stomping around, acting like a Big Scary Bear (this is a favorite Worth game already, which inspired the purchase of these pajamas) and admiring the bear faces sewn onto the feet of his new pajamas. Dorothy decided to put her matching pajamas on as well and join the fun. Sadly, however, she returned crying, having discovered that Carters unwisely manufactured pajamas that were almost identical in both sizes, but which lacked the novelty of bear face feet in the larger size. Curse you, Carters! So I rallied my inner good mother (though she was a bit tired!) and rounded up some felt and sewed my own version of bear faces onto the feet of Dorothy’s pajamas. Now all the Big Scary Bears in my “den” are happy again.